Traditionally, Friday is the day photographers on the Internet post firework photos. Who am I to argue with tradition as I enjoy going through all the wonderful Abstract photos posted to this month’s assignment. Journey into Imagination's Reverse Waterfall as Illuminations fireworks explode overhead in Epcot, Walt Disney World, Orlando, Florida. Nikon D700/Tokina 11-16mm, 8.6s, f/9, ISO 400, EV 0, 16mm focal length, tripod, 3-stop ND filter. I setup a tripod across from Journey Into Imagination’s famous reverse waterfall, controlled the shutter manually and put a 3-stop (0.9) Neutral Density filter on the Tokina 11-16mm f/2.8 UWA lens to take this photo. Have a grand weekend everyone! 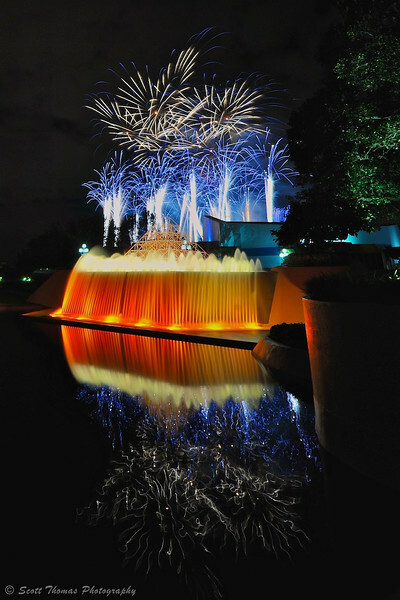 This entry was posted in Photography, Travel and tagged 0.9, 3-stop, 8ND, epcot, fireworks, florida, illuminations, neutral density, nikon D700, orlando, reflection, smooth, tokina 11-16mm, walt disney world, water, waterfall. Bookmark the permalink. Thanks, John…don’t be a stranger! Thank you, Karly. I like your blog’s theme. Very cool. I sure did. Only Disney fan photographers would do this. Most people are crowded around the lagoon. I have seen photos of Illuminations from the back of some the countries, too. But I have yet to photograph it from the “front” between the two stores where it is designed to be seen from. Thank you, Gerry!!! I would hope Walt would like it to, too. My compliments! It must have been very special to see it live, and a challenge to catch it all in time. Love the colors. I have enjoyed this show many times over the years. To see it like this is much different and very challenging without being able to hear the music clues. Wow, what a great photo Scott. Thanks for sharing the details too. lucky to have been there to capture this fantastic photo–love the reflection too. I was lucky to time it right but the show is the same every night. The reflection was an added bonus as it was very calm on this night.